Old Dutch Foods, known for its broad selection of snack foods in the midwest United States and Canada, was struggling to get the right products to the right places at the right time. Its data center included outdated physical servers, and batch processing meant that inventory would not be updated until the end of the day as opposed to real time. In addition, recovering from power outages and disk failures could frequently take up to two weeks. 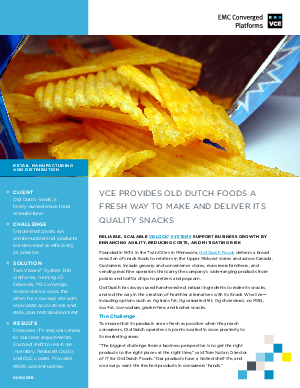 To modernize its data center, Old Dutch Foods invested in EMC Converged Infrastructure. The fast and easy deployment of two VCE VBlock® systems running JD Edwards, MS Exchange, mobile device apps, and operation of a backup site with replicated applications and data. This enhanced the IT department's responsiveness to the business, allowed them to shift to real-time inventory, and reduced CapEx and OpEx costs. Operations were simplified by reducing person-hours needed for infrastructure maintenance by 75 percent.